Leon Reid has been cleared to run for Ireland at next week's European Championships in Berlin after the IAAF granted his international transfer. Reid's late mother was born in Belfast which opened the possibility of him switching to Ireland even though he represented Britain at youth level. "I'm just so happy to get the opportunity to go to Berlin now and do some damage for Ireland," said Reid, who was informed of the IAAF's decision at 09:30 on Friday morning. A statement from Athletics Ireland said the international governing body's nationality review panel had "confirmed that Leon Reid is eligible to represent Ireland with immediate effect". Reid will also compete in the 100m in Berlin after Athletics Ireland provisionally named him in its team on Monday pending the IAAF's ruling while he may also be a 4x400m relay option for the Irish. On Wednesday, there were reports that Reid's prospects of being granted the transfer appeared to be fading but the IAAF verdict went in the athlete's favour on Friday morning. Reid's adoptive mother Claire Russell is a solicitor and the athlete said her expertise played a key role in his successful plea. "My mum had gone through all the legal issues and paperwork and told me everything was in hand and that always made me optimistic even with this week's reports." Last Friday, the IAAF announced new rules ending the total bar on international transfers, which had been in place for more than a year. Reid applied early last year to switch eligibility just before the world governing body halted all international transfers. The IAAF took that decision because of concerns over the amount of predominantly African athletes switching nationality. IAAF president Lord Coe said last Friday that attempts would be made to "process applications quickly" in advance of upcoming area championships such as the Europeans but warned that "no athlete should assume that they will be cleared under these rules". 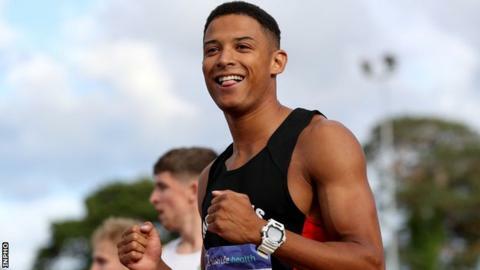 Reid last represented Britain when he won a 200m silver medal at the European Under-23 Championships in July 2015. Crucially in terms of his desire to compete in Berlin, that is just beyond the new minimum three-year waiting period for athletes to obtain transfers. Reports in midweek suggested that the Bath-based athlete's lack of Irish residency status - as required under the new rules - could prove a stumbling block but further paperwork provided by Athletics Ireland in recent days appears to have swayed the IAAF committee. It is thought both Reid and Athletics Ireland insisted that he should be exempt from the residency issue after submitting his original application before the IAAF halted transfers. Athletics Ireland is also understood to have argued that the Court of Arbitration for Sport would have supported Reid's case. After Reid's surprise Commonwealth Games medal, US great and BBC athletics pundit Michael Johnson called on the IAAF to grant the sprinter's request to run for Ireland. The athlete's late biological mother was from Belfast although a difficult upbringing meant the Bath native spent most of his childhood in foster care before he was adopted by county Wexford-born Russell. The sprinter has maintained close contact with his Belfast-based relatives in addition to making regular trips to Wexford to visit his adopted family.